There are three pages of example screenshots. You can select individual pages from the list below, or go through them in sequence by clicking the "Next screenshot" link in the top right hand corner or bottom right hand corner of each page. With a mixture consisting only of alcohol and water we can use an hydrometer and a thermometer to determine the concentration of the spirit, usually in Volume % (ABV) or Proof terms. This is because at any given temperature there is only one combination of ethanol and water concentrations that will result in the specified density. However, when we have sugar in the mixture then the hydrometer and thermometer readings are not sufficient to determine all the concentrations. This is because there are many combinations of alcohol and sugar concentrations that will result in any given density. But if we know the sugar concentration from some other measurement method we can use the hydrometer and thermometer to determine the alcohol concentration. Or conversely, if we know the alcohol Volume % (ABV) or Proof we can use the hydrometer and thermometer to determine the sugar loading. It is therefore still useful to have an hydrometer temperature correction calculator for use with liqueurs. When pure alcohol is added to a liqueur the density decreases, but adding sugar to the liqueur will increase the density. These opposing effects are known as "Proof Obscuration" because the sugar hides or masks the usual decrease in density caused by increased ethanol. Section 30.32 of the TTB Gauging Manual stipulates that for solid contents between 400 and 600 mg/100ml the proof can be calculated by adding 0.4 proof for each 100 mg/100ml of sugar or other solids. This applies only to spirits in the range of 80 to 100 proof, and the maximum value of 600 mg/100ml (or 6 g/liter) is much less sugar than is usually used in liqueurs so this rule of thumb is not helpful in gauging the Volume % (ABV) or Proof of liqueurs. The example shown below illustrates how inaccurate this rule of thumb is when working with liqueurs. In this case we have a spirit containing 150 g/liter (15000 mg/100ml) of sugar with an apparent proof of 10. By calculating the concentrations rigorously the true proof is found to be 94.66. In this case the obscuration is 84.66 proof, or (84.66/150 = ) 0.564 proof per 100 mg/100ml. This is why the TTB requires proof determination to be done by laboratory bench scale distillation when the solids content exceeds 600 mg/100ml. Running a bench distillation to determine the true Volume % (ABV) or Proof after every blending adjustment takes time and consumes product. 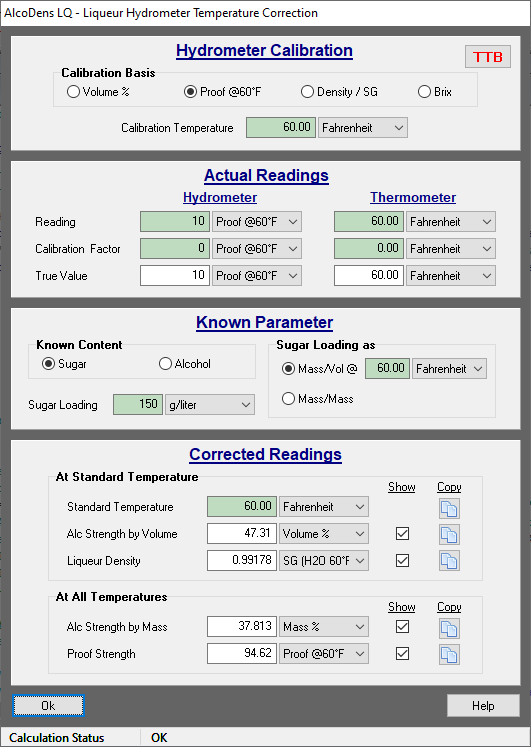 This makes it far better to simply measure the solids content by the usual evaporation method and measure the liqueur density with an hydrometer, and finally determine the proof by calculation as shown here for each blending operation. The final verification of the Proof will have to be done by distillation if you work under the jurisdiction of the TTB. This example shows that when the sugar loading is high the rule of thumb that each 100 mg/100ml of solids obscures 0.4 proof is no longer valid. Here the obscuration is (94.66 - 10.00 =) 84.66 proof and the ratio is 84.66/150 = 0.564 proof for each 100 mg/100ml. Unlike printed hydrometer correction charts which can correct to only one calibration temperature, this calculator is totally flexible and can correct for Density (SG), ABV and Brix hydrometers calibrated at any temperature. Proof hydrometers are of course always calibrated at 60°F. The calibration correction factors for the hydrometer and thermometer can be entered to correct the apparent readings. These factors will be remembered by the program and automatically inserted the next time it is used. This complete flexibility allows you to use an hydrometer calibrated in ABV (alcohol by volume), Proof, Density (SG) or Brix and get the corrected results as ABV, Proof, Density and Mass %. Having all these alternatives displayed at once can be a bit confusing, so the ones that are not required can be hidden by unclicking the "Show" options (see graphic above). Like all the AlcoDens LQ calculators, the Liqueur Hydrometer Correction Calculator can use either the OIML (in vacuum) or the TTB (in air) model, but hydrometers are nearly always calibrated in absolute or "in vacuum" units. The buoyancy of the air has a negligible effect on an hydrometer and even NIST ignores it in their hydrometer calibration services.